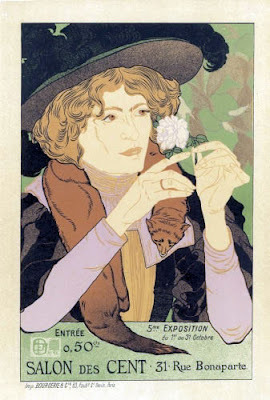 the selection of items is stunning, though what we are shown is primarily the french images only; the japanese 'equivalent,' when one was mentioned, is shown as a thumbnail. still, as always, fascinating. i thought i'd go through the book over time and show you some of the similars they suggest, and others i've found. 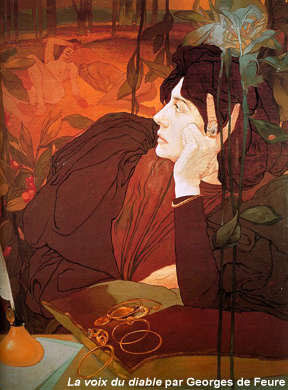 to my eye, this image by georges de feure captures a similar moment in a similar style as well. de feure, in addition to his attraction to the nature-based patterns and decorations of the japanese styles, as well as many of the kimono fashions, is known for portraying women in a way found in the work of few artists of the time. in these, he found depth, variation, pride, thoughtfulness, and a wide range of emotions still notable for their wisdom. in this he shared something with yoshitoshi, whose series does the same from a japanese perspective. the similarity may end there, though. while de feure linked up with samuel bing, indeed so much so that much of the interior of bing's l'art nouveau shop was designed and decorated by de feure, and the store sold much of de feure's furniture. 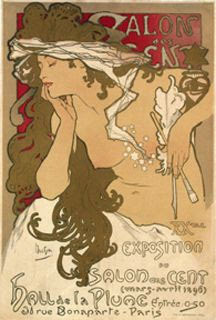 de feure then went on to design furniture for high-end clients throughout paris. 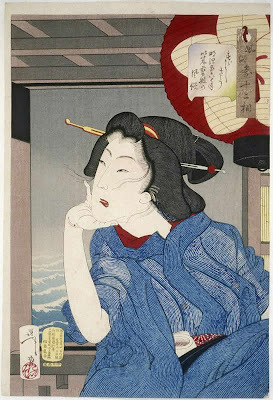 yoshitoshi sold his furniture as well, but in this case it was literal: he had to sell his furniture to pay his bills.